If China's remarkable growth rate follows the typical pattern of industrializing nations, it may be due for a decline. First, let me thank everyone who took the time to write me about yesterday's entry, Here's the Setup for the Con of the Decade. It will take some time to respond to the dozens of emails, but let me say as a blanket statement that I value your thoughtful commentaries and agree that it seems unlikely that the Status Quo will survive an increase in interest rates and the other systemic challenges many of you described. I also agree that the Financial Power Elites might be swamped by forces beyond their control. I would summarize my purpose in writing an admittedly contrarian viewpoint thusly: the conventional inflationary perspective invites us to examine the benefits of inflation to all parties involved: those hoping for a return to rising asset valuations, those clinging to a political power that depends on ever-rising debt, and those paying interest on debt. The basic premise is that the system will implode without inflation, and it certainly looks as if the Status Quo is unsustainable without increasing debt/credit. My entry invites you to explore the idea that paying capital 2% per annum (the 5-year Treasury bond yields 2.2%) while churning inflation along at 4-5% (or more) in real terms is also unsustainable. Those who own the capital and income streams are politically powerful, and they will not sit idly by as their capital is eroded by 3% a year. Indeed, on a systemic level, this eventually leads to impoverishment. In other words, if inflation is goosed to 4% to create an illusion of asset appreciation, then capital will eventually demand a return of 6%, i.e. at least 2% real return. It's not just the Financial Elite who will demand this, it's pension funds and insurance companies who will go broke if their funds lose value every year. I have no idea what the future holds, but it looks like a choice between two forms of unsustainability. Here is a chart of the GDP of Japan and China. The take-away is that developing/industrializing countries experience an extremely rapid growth rate that plateaus or even declines after the "low hanging fruit" of growth has been picked. There is no hard and fast rule, of course, but it looks like the first ramp-up stage takes about 15 years, and the second fast-growth phase lasts about a decade. If we date China's growth as starting around the mid-1980s, then it may be approaching the point of diminishing returns on investment. Indeed, the housing/real estate bubble in China suggests just such an exhaustion of high-return investment. Clearly, China's asymptotic growth rate cannot continue forever. 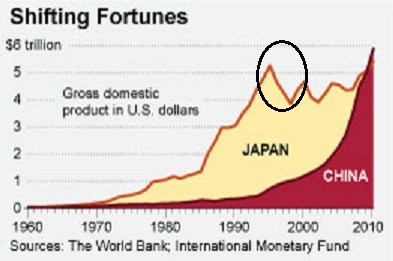 As the oval highlights, Japan's period of seemingly never-ending fast growth ended with a decline. This is not guaranteed, of course, but it does suggest that a decline following rapid sustained growth may be a pattern that typifies industrialization and the inevitable transition from high-yield investment to misallocation of capital and low-yield investments. This chart poses an important question: what will happen to the commodities boom and the global economy if China's economy takes a natural/typical course after two decades of blistering growth and turns down for a few years? It's a question worth pondering, if for no other reason than to consider hedges against the possible answers. Thank you, David S. ($35), for your phenomenally generous contribution to this site-- I am greatly honored by your support and readership. Thank you, John V. ($10), for your splendidly generous contribution to this site-- I am greatly honored by your support and readership.